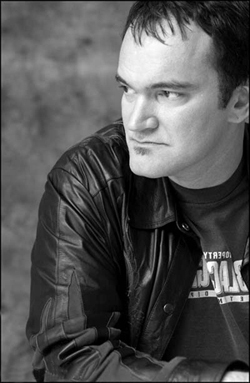 Quentin Jerome Tarantino is an American film director, actor, and Oscar-winning screenwriter. For movies, check the Filmography. Quentin Tarantino was born on March 27, 1963 in Knoxville, Tennessee, the son of a 16 year old nursing student Connie and a 21 year old law student and aspiring actor Tony. Connie named him after Burt Reynolds' Indian character, "Quint" on the 60s TV series Gunsmoke. When Quentin was 2, they moved to South Los Angeles which is where Quentin grew up. His mother took him to the cinema from an early age, he saw films like Abbott and Costello Meet Frankenstein (which was a major inspiration), The Wild Bunch at age 6, Carnal Knowledge at age 8 and Deliverance at age 9. From these early introductions to cinema, Tarantino fell in love with the movies and went at every opportunity. At the age of 22, he landed a job at the Manhattan Beach Video Archives, a now defunct video rental store in Manhattan Beach, California where he and fellow movie buffs like Roger Avary spent all day watching, discussing and recommending films to customers. He made his first (unfinished) film in 1986, 'My Best Friend's Birthday', written with acting class friend Craig Hamann, and followed this up by writing his first script, 'True Romance' a year later. During this period, he was attending acting classes and put together a CV of his (non-existent) acting experience which included a role in Jean Luc Godard's 'King Lear' because nobody in Hollywood would have heard of the film or director and Dawn of the Dead by George A. Romero because he resembled a biker in one of the scenes. His role in 'King Lear' was actually listed in Leonard Maltin's video guide. By 1988, Tarantino had written his second script, Natural Born Killers and in 1990 he sold the script for True Romance for $50,000. He decided to use this money to make his third script, Reservoir Dogs on 16mm and in black and white with his friends in the leading roles. It was around this point that Tarantino left the video store to do rewrites for CineTel, a small Hollywood production company - it was at this time he met Lawrence Bender and struck lucky; Bender was attending acting classes with Peter Flood, who was divorced from acting teacher Lily Parker and knew Harvey Keitel from the Actors Studio. Keitel saw the script and was impressed enough to raise some more finance, act in the film and help Tarantino cast the main roles. At this point, producers Monte Hellman and Richard Gladstein also joined the project. In 1991, Tarantino filmed some scenes at Sundance with him playing the role of Mr. White and Steve Buscemi playing Mr. Pink. These scenes were shown to various film people to comment on and the group containing Terry Gilliam were particularly impressed. Reservoir Dogs finally premiered at Sundance '92 before appearing at various film festivals around the World. Miramax picked the film up for distribution after Sundance and it was released in the US later in 1992 and in the UK on January 8 1993. Tarantino traveled around the various festivals in 1992 promoting his film and writing his next script, 'Pulp Fiction' which went on to win the Palme D'Or at Cannes in 1994. It finally opened amidst incredible hype and critical acclaim on October 14 in the US and October 21 in the UK. Pulp Fiction went on to become one of the most highly acclaimed movies of 1994, grossing over 100 million dollars worldwide and picking up several Academy Award nominations for Best Picture, Best Director, Best Actor, Best Supporting Actor, Actress, Best Editing, and winning an Oscar for Best Original Screenplay. Riding on the success of Pulp Fiction, Tarantino has gone on to be a major Hollywood player, Producing, Distributing films through Miramax with an arm of the company called Rolling Thunder Pictures, Co-Directing and Co-Writing Four Rooms, an anthology-type feature film, Directing an episode of 'ER', a popular TV show, and making many appearances in movies and TV. After having already cooperated with Robert Rodriguez in 'Four Rooms', in 1996 the two of them realized Quentins old script From Dusk Till Dawn. Rodriguez directed. Apart from having written the screenplay he also co-produced and starred as Ritchie Gecko side by side with George Clooney. The movie was a big success and this also leaded to 2 sequels ('Texas Blood Money' and 'The Hangman's Daughter'). In 1996 he also appeared in the movie 'Girl 6', acting himself, Curdled where the 'Gecko Brothers' from 'Dusk' appear he was producing, he made some changes for 'The Rock' and appeared in Steven Spielberg's Director's Chair, a CD-Rom game. Being a fan and friend of the american top-seller author Elmore Leonard, in 1997 he decided to make the movie 'Jackie Brown' based upon Leonard's novel Rum Punch. After a few years of hiatus, he returned to the big screen in 2001 with his magnum opus Kill Bill, which turned out to be enough material for two movies, so it got split into Volume 1 and Volume 2, released about a year apart. The film rekindled a love for Asian and exploitation movies among consumers worldwide and became an instant classic. He also ventured a little into TV, directing the Season 5 finale of the popular crime show Crime Scene Investigation. That double episode, titled Grave Danger, got high ratings and featured many Tarantino signature tricks and interesting cameos. QT at his 2015 Hollywood Star of Fame ceremony. In 2007, he made Grindhouse together with his long time friend Robert Rodriguez. The double feature, a throwback to drive-in exploitation cinema, consisted of Death Proof, directed by Quentin, and Planet Terror, directed by Robert. The movie was hyped, but was financially insuccessful. Nevertheless, it gained a cult following and just like Kill Bill, it led to re-releases of old exploitation films. The Grindhouse style has since been numerously replicated in low budget movies and commercials. Rodriguez has since turned one of the fake trailers included in Grindhouse into a feature film, Machete. Tarantino has talked about a war movie for many many years, but not until 2008 did any of those rumors come together, when he announced that he had in fact finally finished a script for Inglourious Basterds, a massive war epic inspired by European cinema of the pre-war period and the Italian war movie genre, the Macaroni Combat films of the 60s and 70s. The movie went into production that same year, starring Brad Pitt in the leading role. It was a huge international success and gathered quite a few awards. In 2011, Tarantino announced the completion of his latest script, a movie about Slavery in the old US south of the 1860s, titled Django Unchained. Production started in late fall of 2011, and the movie is slated for a release on Christmas Day 2012. The movie has attracted enormous attention, especially because it stars Jamie Foxx, Leonardo DiCaprio, Samuel L. Jackson and Christoph Waltz, who won an Oscar for his role in Inglourious Basterds, and whose career has since gone through the roof. 2015 marked the release of his 8th film, appropriately titled The Hateful Eight, a post Civil War era Western mystery/thriller. 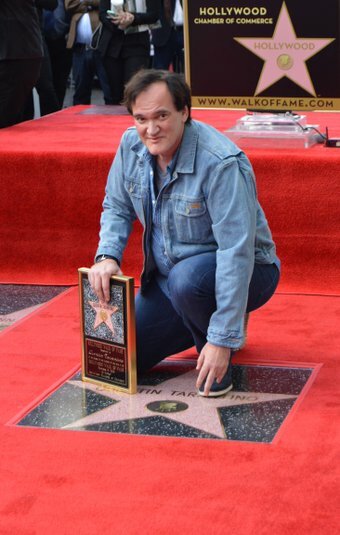 On December 21st, QT received the prestigious honor of his own star on the Hollywood Walk of Fame. In 2017, Quentin Tarantino got engaged to Danella Pick, an Israeli singer and model. On November 28, 2018, the pair got married, just two days after principal photography for Once Upon a Time in Hollywood wrapped, which had started shooting earlier that year and boasts again one of the most impressive ensemble casts. It was overshadowed by the death of Burt Reynolds, who was scheduled for a cameo in the film. Is a huge Elvis Presley fan. Many of his films and scripts have referenced the superstar Rock & Roll artist including True Romance, Pulp Fiction, and Kill Bill. He also has played an Elvis impersonator on the television series The Golden Girls, for which he still gets a decent check for to this day because it was a two part episode and everytime it airs they show his scene in the 'previously on' segment. It may not be a coincidence that Kurt Russell was chosen for the part of Stuntman Mike in his Grind House installment Death Proof, since he too played Elvis in a tv biopic for John Carpenter. Like Stephen King and other popular fiction writers, Quentin Tarantino has professed a desire to segregate his art from the unrealistic to the realistic. His scripts have always existed in one of two universes, the "Movie Movie" Universe and the "Realer Than Real World" Universe. The "Movie Movie" Universe (Kill Bill) are the kinds of films the characters in his Realer Than Real World Universe (Pulp Fiction) would go to see. They are not based in reality at all, they are hyperrealistic. Tarantino has explained that his 5th film Death Proof takes place in the "Realer Than Real World" Universe along with his films Reservoir Dogs and Pulp Fiction. Tarantino, along with his friends Lawrence Bender and Michael Bodnarchek, was a co-founder of A Band Apart, through which he produced most of his films up till and past Jackie Brown. Born: September 3, 1946, Tennessee. Irish-Cherokee Indian descent. Grew up in Ohio. Aged 6, she moves to Cleveland with adoptive parents Betty and Ellis Shaffer. Then moved to California. Born: Queens, N.Y. City, grew up in California. Italian descent. Law student, actor (Pasadena Playhouse etc). Musician (guitar, piano), poetry writer. His Brother also lived with Quentin and Connie. For all his work in TV and film, see Complete Filmography. The Quentin Tarantino Archives Wiki hosts a rising number of Interviews with Mr Tarantino, please navigate to our Interviews Category. This page was last edited on 29 November 2018, at 18:32.